Nothing would please Tehran’s hard-liners more than for the new US president to push Iran back into confrontational mode. Last Thursday, the Senate approved a 10-year renewal of the Iran Sanctions Act. Iranian President Hassan Rouhani immediately called upon outgoing President Obama not to sign it, but Obama’s office indicated that he probably would, holding that there is nothing in the act contrary to the Iran nuke deal, officially known as the 2015 Joint Comprehensive Plan of Action (JCPOA). That deal lifted international and US sanctions related specifically to the nuclear program, but the ISA sanctions other behavior. 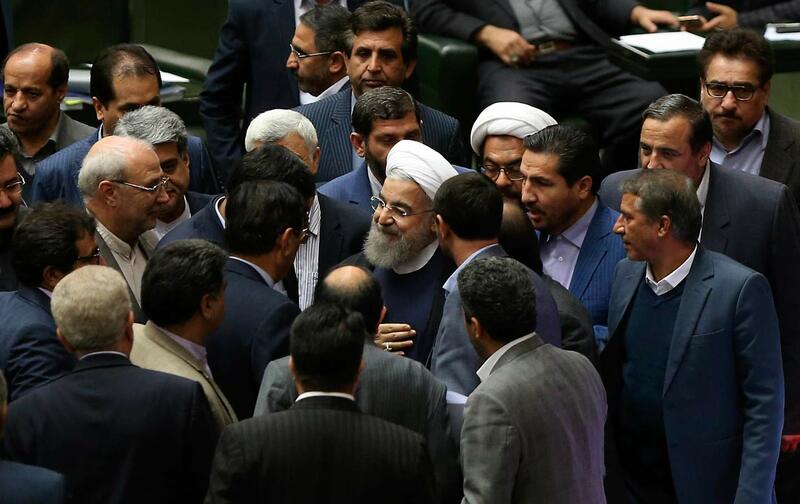 Despite his disappointment, Rouhani indicated that Iran would not allow the deal to be broken. The real question for Iranians, in any case, is what will happen under President Trump, who has promised to renegotiate the nuclear deal. The hard-line newspaper Kayhan knocked Rouhani and his centrists, gloating, “Those who had dreams about America were fooled,” and adding that US enmity with Iran is intrinsic to America as an aggressive imperial power (this according to BBC Monitoring, which rounded up the Iranian press reaction). The equally hard-line Javan joined in, asking, “What will serial infringements against the JCPOA look like in Donald Trump’s administration?”—implying that the president-elect will be even more disappointing to Iranian reformists on this score. The paper urged the government to react forcefully to violations of the treaty. Hard-liners in Iran never wanted the nuclear deal, seeing it as a humiliation and an assault on Iran’s national sovereignty. The more moderate Iran paper pointed out that when he signs the ISA, Obama will exempt Iran from sanctions pertaining to its enrichment program, in accordance with the JCPOA. That step will hold European and other investors in Iran harmless from US Treasury Department sanctions, and make it impossible for Trump’s Treasury Department later on to go after those firms, since they can claim in international tribunals that they acted in good faith and in accordance with Obama’s signing statement. Other Iranian observers moved beyond the nuclear issue to slam or welcome Trump. Admiral Ali Shamkhani, head of the Iranian National Security Council, worried that Trump is committed to vastly expanding US oil exports (presumably he means through finalizing the removal of any restrictions on such exports, and through expansion of natural-gas fracking). More US oil on the world market would depress prices for OPEC countries such as Iran, which just reached a Russian-brokered deal to reduce output so as to firm up prices. Iran’s $100 billion budget for next year depends on an oil price of $50 a barrel, well above the $40 a barrel written into the budget for 2016. Shamkhani clearly worries that the Trump factor will undermine any new price stability and hurt Iran’s bottom line. Likewise, speaker of the Iranian parliament Ali Larijani was quizzed on the hard-line anti-Iran figures Trump has seeded into his cabinet (the nominee for secretary of defense, General James “Mad Dog” Mattis, is to Iran as Ahab was to that whale). He urged a wait-and-see attitude, pointing out that officials’ past positions were not as important as their actual policies once in office. Larijani, like many Iranian observers, is clearly intrigued with Trump’s Syria and Russia policies. Iranian officials have been upset with Obama for his backing of Sunni fundamentalist rebels in Syria, most of whom have made dire threats against that country’s Shiites. That Trump has criticized this policy, averring that “we don’t even know who [the rebels] are,” has raised some hopes in Tehran that the long and debilitating Syria struggle might find resolution on Iran’s terms under the new American president. Iran’s economy has grown 4.5 percent during the past year, compared to only 0.4 percent the previous year, and Rouhani’s circles are claiming credit, saying that the end of sanctions have brought new trade and investment. The reformists in Tehran need that sort of economic progress to continue if Rouhani is to win his second term as president in elections scheduled for next summer. The hard-liners are hoping for an upset, and nothing would please them more than for the new American president to push Iran back into a confrontational mode. The Iranians are eyeing Trump, trying to figure out if there is any benefit for them in his coming to power. Like everyone else, they are being kept on their toes by Trump’s contradictory and erratic pronouncements.